I have two ziploc bags that stay in my freezer and refrigerator for squeezed out citrus peels. The ziploc in my refrigerator has lemon and lime peels. 2) Rub them over cutting boards, letting the cutting board sit for a while, wash, rinse clean and dry. The citric acid will bleach out the stains and disinfect the board at the same time. 3) Sprinkle with baking soda and rub onto stained Tupperware. You may need to let it sit over night. Once they've been used from the refrigerator, they go into the freezer bag. The ziploc in my freezer has all citrus peels, grapefruit, lemon, lime, oranges, etc. Once they are frozen sprinkle a spoonful of baking soda in the center, and put them through your garbage disposal with a couple of ice cubes. Lemons and salt is what I used to remove rust stains from my bathroom floor when we were remodeling it and took out cabinets to find OLD stains... it was a lot of scrubbing but it TOTALLY worked! GREAT tip! Sorry I'm so late coming around this week, it's been crazy. Ok this is cool! Never knew it. I'm glad you found this helpful. Trying to think of little things that I do that I don't see everyone doing. Sandra... so jealous of your lemon tree! I couldn't grow one here though even if I wanted to. Fifi: I can't believe I forgot to mention rust. That's what I used to clean the rust out of all the bathrooms of the house when we lived in Illinois. The iron levels were amazingly high there. Every shower, bath, sink, the house siding, everything that water contacted. 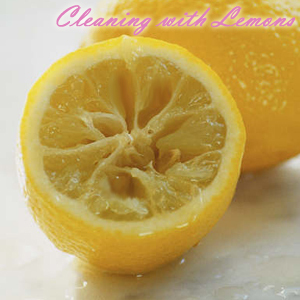 Lemon juice and salt together can work wonders and it's much safer for us and the environment. Hubby always laughs at me when he finds the lemon bag in the freezer and just a bit snarky when he find them in the garbage disposal before I'm done for the day. I thought I was the only one who did this (a hand me down from grams).